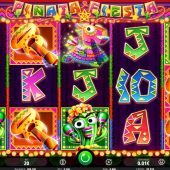 Pinata Fiesta slot by iSoftBet colourful fun and random features! 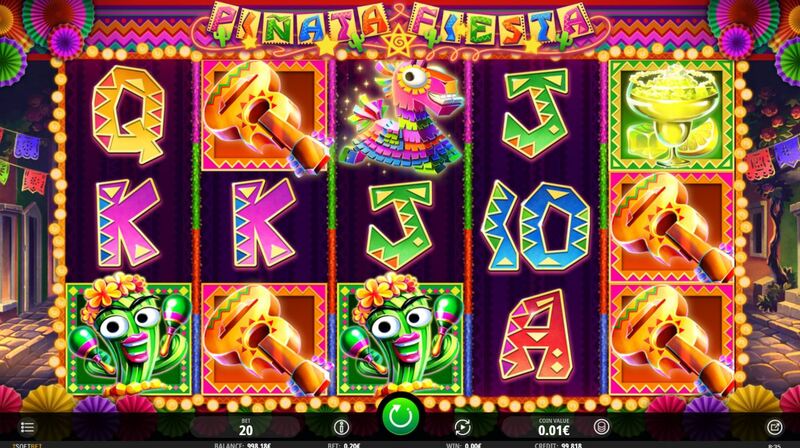 Pinata Fiesta slot by iSoftBet brings us all the colour and hints of hidden surprises of this old Spanish custom. Pinata is a papier-mache donkey traditionally filled with sweets and treats for children, is hung up and they beat it with coloured sticks until it tears to reveal the goodies. Not sure about the connotations with animal cruelty this has nowadays but they seem to like it. Anyway, the theme has been around a while with Pinata Bandidos slot from Genesis Gaming and Leander's Mad Pinatas but Netent's Spinata Grande is the one you're most likely to have played beforehand. The reels are set over a night-time street festival and you play to the obligatory Latin fiesta style of music but can we actually beat out some profit for our bankroll here? There are 20 fixed lines on Pinata Fiesta slot with the very brightly coloured symbols appearing both stacked and singly. The pays aren't huge as this seems at first look to be a low-volatility fun game and the 5-of-a-kind pays for your 20-coin bet are 250 coins for Red Chilli, 200 Green Pepper, 150 Guitar, 100 Lemon Drink and five card values paying from 50 down to 25 coins for a line of 5. You have both Pinata Donkey scatters on all reels and Wilds in the form of Gold Stars but before we see the reard for the scatters, naturally the Pinata holds a few surprises inside it. Mega Spinata - the first 3 reels turn into colossal 3x3 symbols only for a guaranteed win. Grande Reels - a random amount of reels turn Wild. Fiesta Frenzy - all royals on the reels (the picture symbols) will turn into one of the four possible for a bigger chance of a higher win. Popping Wilds - balloons will rise up over the grid and if they pop will transform that tile into a Wild symbol. If you see 3,4 or 5 Pinata Donkey scatters you are awarded 10,15 or 20 free games. You may well have anticipated that the enhancements here are provided by a higher frequency of the Pinata Spins described above. You can also retrigger them and there's a final twist - you will be offered a choice of 3 Pinatas at the conclusion of them and will choose one to break. It will either be end of bonus or you will be awarded a random amount of extra spins. Once these are over, should you win them, you don't get another choice.